Amazon is running a big sale right now on the GoPro HERO5 Black action camera, slashing a whopping $150 off the price tag. Of course, it’s still super expensive even with that big discount. 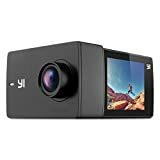 If you’re looking for looking for a high-quality action camera with 4K resolution that isn’t quite as fancy or expensive as GoPro’s camera, the YI Discovery Action Camera is a terrific option. It’s also available right now on Amazon for just $44.59 if you use the coupon code YIDISCOV at checkout.